The weather outside may be frightful, but your holiday habits don’t have to be. Looking for ways to be more kind to the earth this season? There are plenty of easy things anyone can do to make their home more efficient and comfortable this winter. I’ve made a list and checked it twice, and think you won’t find my tips more naughty than nice. LIGHTING: If you’re opting to decorate the heck out of your home’s exterior, but want to save money on the energy bills, check out the wide array of LED lights (light-emitting diodes) on the market. They use only a tiny fraction of the energy that conventional string and decorative lights use, plus they last much longer! Save even more money by putting your lights on a timer. This way, they can turn on just as you’re coming home to light your way up the driveway and won’t be forgotten at bedtime when you’re too tired to remember to turn them off. DECORATING: Deck your halls with re-purposed items or those made with recycled content or natural materials. Try to limit use of wasteful disposable items. Here’s a few ideas: orange pomanders, holly boughs, cranberry garland and handmade salt dough ornaments. 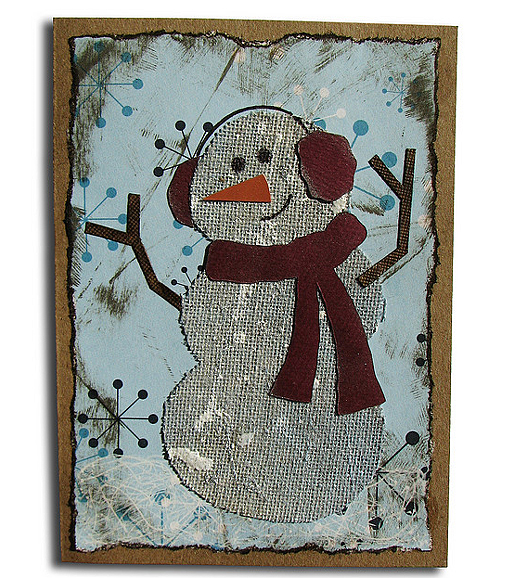 Also, homemade holiday cards (like the one pictured here) are extra special. TREES: Real Christmas trees are actually better for the environment if you purchase one that can be replanted in the yard in the spring. You’ll get a lifetime of enjoyment out of it instead of just a few weeks. Keep in mind that most artificial trees are petroleum-based and won’t biodegrade at the end of their life-cycle. GIFTS: Look for items with minimal packaging, especially non-bio-degradable bubble plastic. Shop the “Green Pages” for eco-friendly and fair-trade treasures. Consider purchasing a sponsorship of a natural place (typically $20 or so, which sometimes include stuffed toy animals you can include as part of the gift). The Sierra Club, for instance, offers packages to help protect awe-inspiring wild places like Yellowstone, Grand Canyon Park and Giant Sequoia National Monument. GIFT WRAPPING: Wrap in the newspaper’s funny pages, old calendar pictures, posters or other paper destined for the recycling bin. Kid’s drawings make a cute wrapping for small gifts. Also, by wrapping the top and bottom of boxes separately, the paper will remain intact and they can be used again next year. Re-usable gift bags are great since they can be used year-after-year. SHIPPING GIFTS: crumpled magazine pages provide great padding to breakable packages instead of bubble wrap or foam peanuts. HOLIDAY FEASTS: Local and organic food and spirits taste better! Remember to compost fruit and veggie scraps. Also, washable, fabric napkins make any meal feel more special. HEATING YOUR HOME: An extra sweater will keep you warm and toasty without having to turn up the heat, so why not sport that one in the back of your closet with the big, red-nosed reindeer on front?! If you’ll be lighting your fireplace this chilly winter, take a look at some tips I wrote on increasing its efficiency and cleaner-burning logs. Read my previous post to save energy and money on home heating this winter. RECYCLE and RE-USE all that you can, from compostable food scraps, to paper, cardboard, bottles, plastic and cans. BE THANKFUL for all that is good in your life! After all it is the season to be jolly. Happy Holidays!